Resilience is a biopsychosocial phenomenon-it encompasses personal, interpersonal, and community experiences. 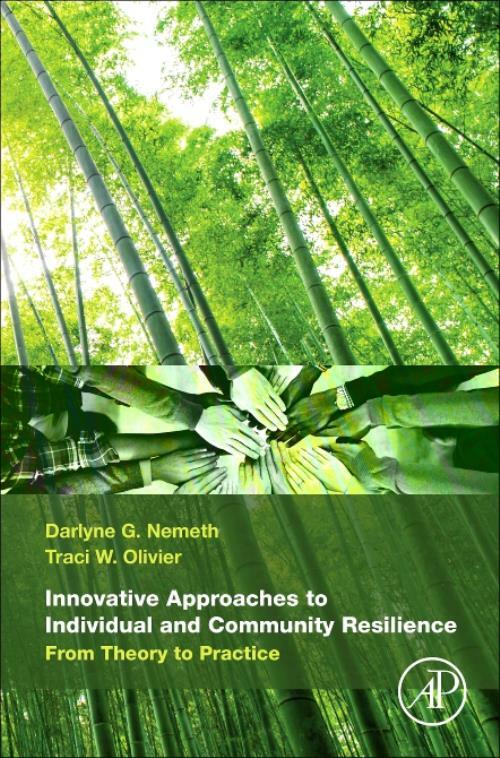 Innovative Approaches to Individual and Community Resilience reviews the current research and details differing levels and approaches to resilience. On a microlevel, this book specifies how to develop appropriate coping strategies, maintain cognitive flexibility, and identify, label, and share feelings before acting upon them. On a macrolevel, it defines and explores environmental resilience, social resilience, community resilience, and family resilience. It focuses on the importance of family, community, and spiritual bonds, in order to share experiences and enhance posttraumatic healing. The need to be firmly grounded in today, while learning from yesterday, in order to cope with the requirements of tomorrow is the primary emphasis of this book. Darlyne G. Nemeth, Ph.D., M.P., M.P.A.P., an accomplished clinical, medical, and neuropsychologist, has a broad-spectrum practice at the Neuropsychology Center of Louisiana (NCLA). Dr. Nemeth was among the first medical psychologists in Louisiana to obtain prescriptive authority. She is a fellow of the American Psychological Association (APA) and served on the APA Council of Representatives for two terms 2010-2016. Dr. Nemeth served as one of the World Council for Psychotherapy's (WCP) United Nations (UN) Nongovernmental Organization's (NGO) Delegates for 10 years and was Vice President for the U.S. Chapter of WCP for 3 terms. She is currently serving as WCP's Co-Secretary General. As an expert in group dynamics, Dr. Nemeth has been nationally and internationally recognized for her Hurricane Anniversary Wellness Workshops, which were offered to the victims/survivors of Hurricanes Katrina and Rita in the summer of 2006. The results of these workshops were presented at the 2013 Meeting of the American Group Psychotherapy Association (AGPA) in New Orleans, LA. Anniversary Wellness Workshop Training Programs were also conducted in China at the 2008 WCP Meeting and in Australia at the 2011 WCP Meeting. In August, 2014, Dr. Nemeth gave the Keynote Address on Psychological Leadership in the Event of Environmental Trauma at the WCP Meeting in Durban, South Africa. In, 2016, South Louisiana experienced a Great Flood causing thousands to be displaced. Emotional Resiliency Workshops were developed and conducted by Dr. Nemeth, who is also an Environmental Psychologist, to help children, adolescents, and adults coping with this major disaster. In March, 2003, Dr. Nemeth was the lead author on a book titled, Helping Your Angry Child published by New Harbinger. She served as the Lead Editor for the 2012 book, Living in an Environmentally Traumatized World: Healing Ourselves and Our Planet, published by ABC-CLIO/Praeger, and the 2015 anthology, Ecopsychology Advances from the Intersection of Psychology and Environmental Protection, also published by ABC-CLIO/Praeger. In 2012, she was the lead author on an anniversary wellness workshop article that was published in the International Journal of Group Psychotherapy (IJGP). Dr. Nemeth then published an article in 2013 in Ecopsychology on preparing individuals and communities for hurricane anniversary reactions. Dr. Nemeth served as Director of Neuropsychology at Sage Rehabilitation Hospital Outpatient Services for five years. While there, Dr. Nemeth developed a Hope Therapy Group Program for Brain-Injured Adults, which was presented at the 2013 AGPA meeting in New Orleans. She was also the lead author on an article outlining this process, which was published in IJGP in January, 2015. In 2016, Dr. Nemeth was invited to give two keynote addresses at the First Congress on Mental Health: Meeting the Needs of the XXI Century in Moscow, Russia: 1) Building Individual and Community Resilience in This Age of Depression and Environmental Trauma and 2) The Influence of Perception on Our Mental Health and Well-being. Subsequently, Dr. Nemeth has been invited to serve on the Organizing Committee for the Second World Congress on Mental Health in Moscow, Russia in 2018. Dr. Nemeth obtained a Bachelor's degree from Indiana University in Music and Radio/Television Broadcasting, a Master's degree from Oklahoma State University in Higher Education: Student Personnel, a second Master's degree and a doctoral degree from Louisiana State University in Clinical Psychology, and a Post-Doctoral Master's degree from the California School of Professional Psychology in Clinical Psychopharmacology. Besides being active in the practice of clinical, medical, & neuropsychology, and psychopharmacological management, Dr. Nemeth has written chapters on the history of psychotherapy in the United States, anger management for children, and pediatric medical psychopharmacology. Dr. Nemeth serves as an externship advisor/mentor for future psychologists. For her outstanding efforts, Dr. Nemeth was given the 2010 Distinguished Psychologist award by the Louisiana Psychological Association (LPA). She currently serves on LPA's Executive Committee, and is a member of the American Group Psychotherapy Association (AGPA), where she has obtained recognition as a Certified Group Psychotherapist (CGP), the Louisiana Group Psychotherapy Society (LGPS), and the Louisiana Academy of Medical Psychologists (LAMP). Dr. Nemeth maintains membership in the International Neuropsychology Society and the National Academy of Neuropsychology. She has also served as a member and Vice Chair of the Louisiana State Board of Examiners of Psychologists. Her Web site is www.louisiananeuropsych.com. Traci W. Olivier, Psy.D. earned her doctorate in clinical psychology at Nova Southeastern University in 2016. After completing her internship at the Kennedy Krieger Institute and Johns Hopkins University School of Medicine in pediatric neuropsychology and consultation, she continued her training in pediatric neuropsychology as a postdoctoral clinical and research fellow at St. Jude Children's Research Hospital (SJCRH) in Memphis, Tennessee. Throughout her training, she has worked extensively with Dr. Darlyne G. Nemeth at the Neuropsychology Center of Louisiana. Over the course of her graduate career, Dr. Olivier has obtained specialized training in neuropsychological evaluation and intervention with patients across the lifespan, and she has maintained an active role in research over the years. Dr. Olivier's particular interests surround pediatric deafness, neurocognitive late effects of cancer-directed treatment, and resiliency in children and adults. Dr. Olivier maintains active memberships in professional organizations and regularly presents at conferences such as the American Psychological Association, the International Neuropsychological Society, the National Academy of Neuropsychology, and the Louisiana Psychological Association. When she is not in the office, you can find Dr. Olivier spending time with her husband, Lawrence Olivier, II, MBA or with her "fluffy little man, Maison. If she's not with either of those two, she's likely in the kitchen trying out a new recipe.